Alessandro Restelli demonstrates the new detector control system. By employing a technique analogous to the operation of noise-canceling headphones, PML researchers have created an exquisitely sensitive, semiconductor-based, single-photon detection system that has the highest reported detection efficiency of any device of its type and is capable of detecting hundreds of millions of photons per second with very low noise. Such capabilities are in critical demand as part of the worldwide effort to provide practical and provably secure communication systems that encode information in the quantum-mechanical states of individual photons to generate secret encryption keys. A widely used technology for detecting those photons is the single-photon avalanche diode (SPAD). * But the performance of SPADs has, to date, been a limiting factor in the overall encryption system. One issue with SPADs, particularly those sensitive to telecom wavelengths, is a process called afterpulsing, in which an actual photon detection can sometimes cause a second, false output at a time when no photon was present. To suppress this, electronic signals are applied to the detector, but these signals are many orders of magnitude larger than the tiny signal generated by a single photon and can make it difficult to identify a definitive "hit" amid the electrical interference. The PML team attacked these problems by devising a unique control system that dramatically improves detector performance. 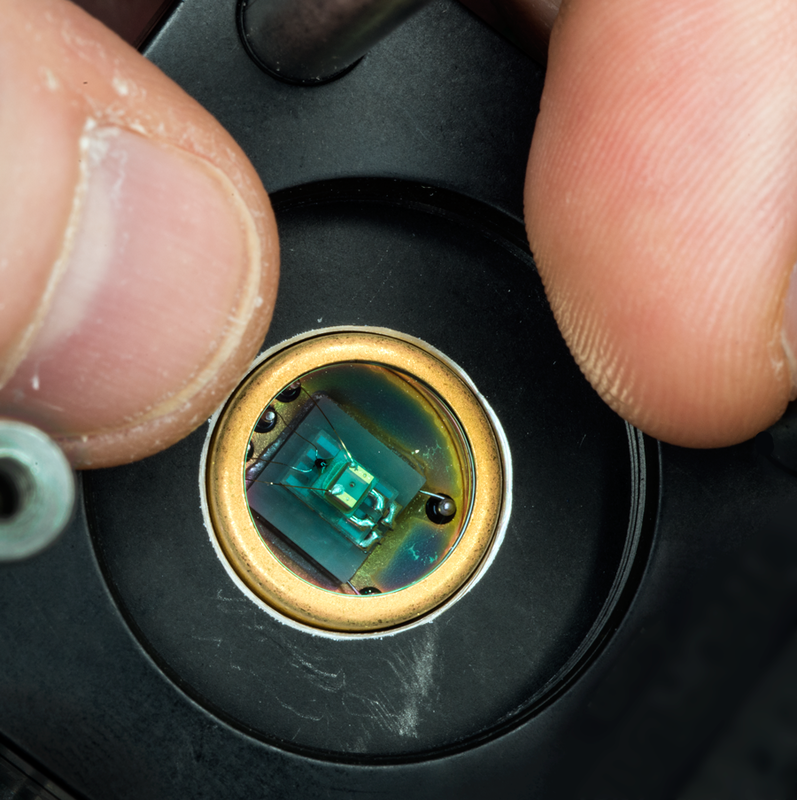 "Recently, InGaAs/InP SPADs have gotten pretty good, with a potential detection efficiency above 70 percent," says Josh Bienfang of the Quantum Measurement Division's Quantum Optics Group. "But extracting their full potential has been a challenge, and that's where we've been focusing our attention. The idea is, 'Ask not what your SPAD can do for you. Ask what you can do for your SPAD.' "
What Bienfang and colleagues can do is suppress the electronic interference by an extremely large factor, in excess of -65 dB. The researchers achieve this by carefully generating and manipulating the electronic signals used to form the SPAD's periodic "gates." The term refers to the time interval, on the order of a few hundred picoseconds, during which a single cycle of detection takes place. Output signals from the detection system (after a low-noise output amplifier), showing both avalanches and the background noise floor. The noise floor allows the use of a minimum threshold below 2 mV in a 5GHz bandwidth. As can be seen, nearly all avalanches can be discriminated from the noise floor. The cycle begins when an electronic pulse biases the detector strongly with a voltage − 20 V in this case − that is high enough to allow a single charge carrier to cause an avalanche. The higher the voltage, the larger the avalanche current and the stronger the signal. The avalanche is terminated at the end of the electronic pulse when the bias voltage returns to its original low value, where it remains until the next bias pulse is applied. It might seem that the best way to improve performance would be to increase the voltage and therefore the number of avalanche electrons. But that also increases the probability of afterpulses, which arise when charge gets trapped by defects in the diode material. "It's released probabilistically over time," Bienfang says. "But remember that this is a device that only requires one charge to make a large, detectable signal. So if there's even one charge remaining when you reactivate the device, it can cause an output pulse that is indistinguishable from the effect of a photon." The idea is to ask the SPAD to do as little multiplication as necessary to detect a photon, and this requires shortening the duration of the electronic pulse. Bienfang and colleague Alessandro Restelli accomplish that by using a radio-frequency generator to construct a signal pulse that is not a single frequency, but a combination of two, three, and finally four synchronized harmonics. This has the effect of narrowing the pulse duration to as little as 150 picoseconds. "The whole idea," says Quantum Optics Group Leader Alan Migdall, "is to have as few charges in the material as possible after you have accumulated just enough for a signal. Josh and Alessandro found that reducing the time interval for a factor of two caused almost an order of magnitude reduction in the number of charge carriers in the SPAD." Better yet, "because we constructed the gate pulse from radio-frequency components we generated ourselves, we know exactly the phase of the components of the electronic interference we need to eliminate," Bienfang says. That allows the researchers to generate a secondary signal that is opposite in every respect to those of the electronic interference. "We superimpose the two and they cancel each other out while the SPAD output is measured," he says. "If we do it correctly, there's no remnant of the 20 V gate pulse. There's just the minute avalanche signal." "The amount of charge we're able to detect is very, very small," says Restelli. "About 45,000 electrons are all it takes to get to our threshold. That's in the neighborhood of a few femtocoulombs." SPADs are typically small. Here a unit used in testing is seen at the center of the round aperture. Maintaining precise control over the amplitude and phase of the interference signals is a difficult business. "We wanted to see if we could stabilize amplitude and phase by using solid-state devices mediated by simple voltage changes," says Restelli, who built a feedback mechanism that samples the waveforms 120 times per second. "It's difficult to lock onto a point, and distinguishing between a phase change and an amplitude change is tricky – the two errors look exactly the same." The SPAD project is being supported, Migdall says, "by popular demand" from quantum-information research groups including those participating in a long-term DARPA initiative called Quiness, the primary goal of which is "to demonstrate that quantum communications can generate secure keys at sustainable rates of 1 – 10 gigabits per second at distances of 1,000 to 10,000 km." So Bienfang and Restelli have begun the process of determining how to package the system for collaborations outside NIST. Some environmental effects caused by fluctuations in room temperature, local vibration, and electromagnetic interference are not yet fully characterized, and more testing is underway. "But from a user standpoint, what we have now was impossible a year ago," Bienfang says. "This is really a big improvement. 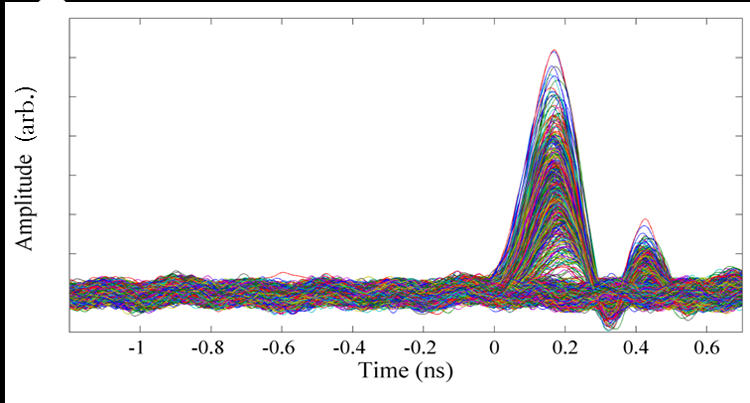 Our afterpulsing is roughly an order of magnitude lower than other systems at similar detection efficiencies. The low avalanche-detection threshold has really proven its value. There is a statistical variation in avalanche size, so our ability to detect smaller signals is one of the reasons we see higher detection efficiencies. "Not so long ago, a detection efficiency of 20 percent for this sort of SPAD was considered pretty good. With our new system, we've recently reached as high as 60 percent, which is approaching the maximum rated efficiency of the diode itself. If that's true, then it means that we're detecting close to 100 percent of the avalanches, and we're limited only by the absorption properties of the material." * A single-photon avalanche diode (SPAD) is a detector capable of amplifying the effect of one incident photon on a semiconductor into a signal large enough to measure. When a photon's energy is absorbed by a valence electron in the detector material, that electron can "jump" into the conduction band, leaving behind a positively charged "hole" at its former location. The process is sometimes described as creation of electron-hole pairs. These mobile charges can transfer their energy to other atoms in the lattice of the diode. In the absence of an applied field, this effect is vanishingly small. But when a voltage is applied to the material, a charge can gain enough energy to generate a second electron-hole pair. Then both travel off to excite yet more charges and so forth in an exponential amplification process called an avalanche. High-speed quantum communications requires high-speed streams of photons, and the SPADs used to detect them have to be capable of registering many millions of photons per second. This is made possible by exposing the SPAD to a series of electronic pulses that alternately raise and lower the voltage on the device, creating periodic time windows, or "gates," during which a photon can be detected.